You've reached the right place for professional disc replication ...printing, premium packaging, cds, dvds, full 12cm size, mini 8cm size, clear substrate cds....and the experience to see your project through. We believe strongly in treating others as we'd like to be treated. To us that means quick replies, personal service, experience & knowledge, no hidden or extra charges, and continuing support and contact throughout a project. or Request a Quote Now ! Discs in a variety of popular packages especially suited to multi-disc sets. Discs with folders, jackets and wallets. Chose from simple envelope style to gatefolds. Discs in recycled content packaging, available with a variety of panels. Has foam hub to hold the cd. Fiberboard version available! Discs in Custom Tray style folders w/ clear tray, available in a variety of styles and panels. easy to distribute to your clients. Discs in a special 3D PopUp package. Very eye catching at conferences! w/ wrap & inside booklet. Discs packaged in retail software boxes w/ options for sleeves, jewelcases or wallets. Discs with plastic jewelcases, inserts, folders, booklets & tray cards. Pressed disc manufacturing- includes offset or silk-screening 5C & printed test disc. Rush schedules available, no charge. 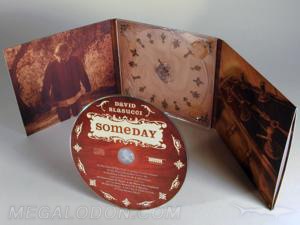 Mini CD, rounded- and rectangular CD biz card style cd manufacturing - includes offset 5C & printed test disc. Rush schedules available, no charge. Clear substrate cd manufacturing- includes offset 5C & printed test disc. Rush schedules available, no charge. "Thank you so very much for the wonderful customer service! The cd's look great!" "You guys will definitely be our exclusive cd vendor." All discs are pressed, made from glass masters.